When you’re out and about with your camera, it’s easy to not think about the film until you need it. But if not handled properly, your film can get damaged easily, leaving you with a pack that’s useless. 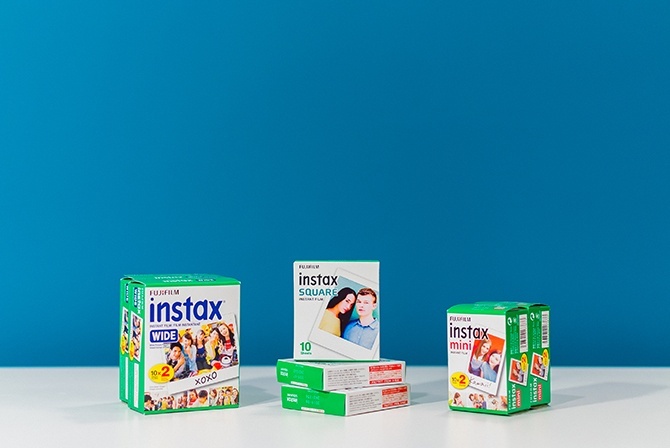 Here are some tips to keep your instax film fresh and protected, so you can make the most of it and perfect your instant pic-taking skills! It’s easy to expose unused film. When removing film from the pack, you’ll want to load it into the camera as soon as possible and avoid opening it in direct sunlight. After opening the film pack, make sure you don’t leave it in a bright place. The optimal temperature is 5-40 degrees Celsius. The film doesn’t do well in high temperatures or high humidity, so be mindful of this when you are travelling. If you know you won’t be using all your film straight away, it’s safe to store it in your fridge — as long is the temp is below 10 degrees Celsius. When you take the film out after storing in the fridge, wait at least 12 hours so it can reach room temperature. Opening it while it’s still cold can damage the film. Just because the film is inside your instax, doesn’t mean it’s totally safe. Keep loaded cameras out of the heat and humidity as well, and away from water. You want your pics to last forever, so ensure their quality lasts long after they’ve been developed. Keep them on display at moderate temperatures, and out of water’s way. Instax has some awesome accessories to help you safely store your snaps, like photo books that cover and protect the film.